The Super Bowl is rushing toward us like a 300-pound lineman. So get those party platters spinning! You’ll need plenty of munchies and goodies. 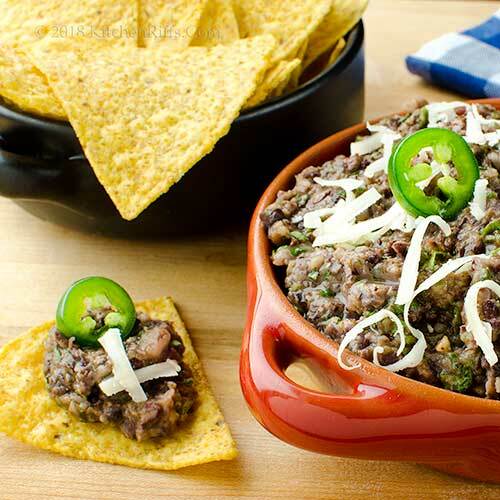 One of our favorites is this spicy Jalapeño Black Bean Dip. It’s an easy recipe, and fast to make. So you’ll have more time to spend with your guests. And watch your team win. Or not. This recipe makes a fairly thick, viscous dip – so it’s perfect for dunking corn chips or spreading on a cracker. You could even use it as a sandwich spread. We use canned black beans for this recipe, so it’s quick and easy. You could also use dried black beans, though that would take longer (see Notes). No black beans on hand? Pinto beans would work too. The basic recipe calls for one can of black beans, which yields about enough dip for a bag of chips (depending on how large the bag is, of course, and how much you load onto each chip). If in doubt, it’s easy to double the recipe. Or triple it! This recipe takes 10 to 15 minutes to make. You can prepare it a day ahead if you want (refrigerate the dip in an airtight container). Leftovers keep well for several days. Open the can of black beans, pour the contents into a strainer or colander, then rinse off the gunk the beans are stored in. Peel the garlic, chop it roughly, then add it to the bowl of a food processor. Cut an onion in half, then half again. Peel one quarter, then chop it roughly and add it to the bowl of the food processor. Reserve the rest of the onion for another use. Wash the jalapeño pepper(s) and cut off the stem ends. Cut the peppers in half lengthwise. Use a teaspoon to scoop out the ribs and seeds (be careful – the oil on these is hot, so avoid touching your eyes). Chop the peppers roughly and add them to the bowl of the food processor. Then wash your hands with soap and water to remove the hot jalapeño oil from your skin. Pulse the food processor a few times to finely chop the garlic, onion, and jalapeño. Add the black beans to the food processor. Squeeze the lime juice and add it to the mix. Add the cumin, chile powder, and salt. Pulse the food processor until the beans are almost the consistency you prefer (most people like this dip to be fairly smooth, though chunky is also good). Wash the cilantro, chop it roughly, then add it to the food processor. Pulse until it’s just incorporated into the dip. Taste the dip, then adjust seasonings if necessary. Scrape the dip from the food processor into a serving bowl. Garnish, if you wish, with grated Cotija cheese and/or jalapeño slices. Serve with tortilla chips. 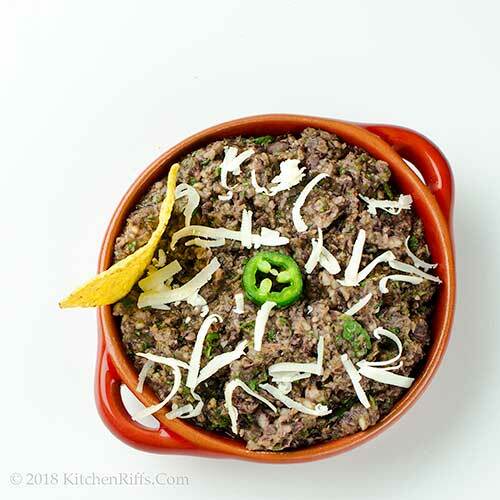 Want to use dried black beans in this dish? Remember that one pound of dried beans equals about three to four 15-ounce cans: Pick over the beans to remove any dirt or grit, then soak the beans at least 8 hours. When ready to cook, drain the beans, then place them in a cooking pot and add enough water to cover the beans by about an inch. Simmer for 1½ hours. Drain the beans and cool them, then proceed with the recipe. We like to garnish this dip with Cotija cheese (Queso Cotija), which is a hard, crumbly, salty Mexican cheese. We grate an ounce (maybe a bit less) and sprinkle it over the dip when using it as garnish. You could also substitute Queso Fresco (which is slightly softer) or Parmesan (which has a flavor that’s somewhat similar to Cotija). We love jalapeño peppers, so we also add a slice (or several dice) as a garnish. BTW, if jalapeño is too hot for you, skip it entirely. The dip will still be good. Or if you really like heat, you could use canned chipotle peppers, which are smoked jalapeños (use a bit of the adobo sauce they’re packed in, too). Chile (with an e) powder consists of ground chilies. Chili (with an i) powder is a blend of chile powder plus other seasonings (usually oregano, cumin, coriander, and salt). 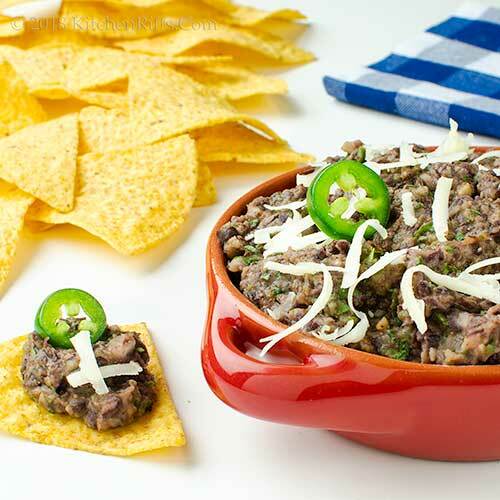 We suggest using dried ancho chile powder in this dip. It’s available in most supermarkets and is fairly mild. Dried chipotle chile powder would also work well, but it’s much spicier than ancho. Or you could substitute chili powder. By the way, if this dip isn’t as spicy as you’d like, just stir in hot sauce to taste. You could also add some dried coriander to this dip if you’d like. A tablespoon or so of tomato paste, or ¼ cup of salsa, would also be a nice addition. We use a few pinches of kosher salt when we season this dip. Kosher salt has larger flakes than regular table salt, so it’s less salty by volume. If you’re using regular table salt, keep that in mind. But in any case, season to your taste, not ours. “Are you sure you want to align yourself with the Eagles fanbase?” asked Mrs K R.
“Hey, Eagles fans are the most dedicated crazies in the world!” I said. I could almost sit through watching a game if I had a fresh supply of this dip to eat. I know, like I am the only person who doe snot watch it lol. Nice spicy kick! Hi Evelyne, I think most people who attend Super Bowl parties are there for the friendship and the food, not the game. :-) Thanks for the comment. I could eat the dip spoonful! Looks really great and I love the warm spices in it too. Hi Angie, this was actually our entire dinner the night I made it. :-) Thanks for the comment. Hi Mae, been there, done that with touching my eyes after handling chilies. Yeow! Does that sting. :-( Thanks for the comment. Should be working but I'm salivating over this recipe! Perfect for upcoming Superbowl! Hi Debra, I often avoid work by salivating over recipes. :-) Thanks for the comment. My entire family would devour this dip. It looks and sounds amazing. Hi Pam, it's wonderful. :-) Thanks for the comment. I am up for anything and everything with jalapeno! Hi Laura, we are too! :-) Thanks for the comment. Hi Vicki, the kick is nice! :-) Thanks for the comment. Just love this dip, thanks John! 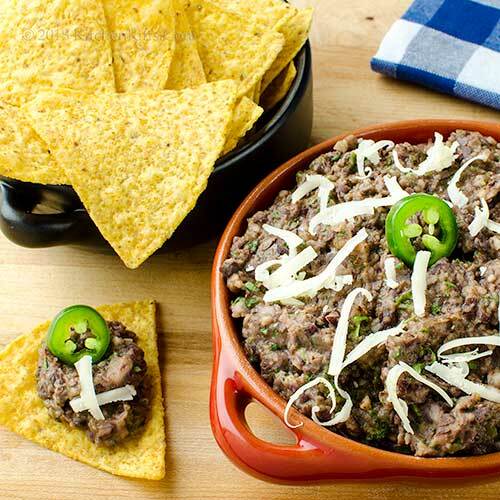 We love bean dips, this one is flavoured and spiced beautifully. A great addition to our superbowl party. I generally don't watch the game but sit in for the ads which are mostly interesting or funny. Hi Gerlinde, it's a nice one. :-) Thanks for the comment. Hi Rocquie, we haven't had this dip hot, but it's a great idea! Thanks for the comment. Hi Eva, the ads -- and the food! -- are often the best part. :-) Thanks for the comment. Zoe sent me a video of the fans in the streets. She lives right near Rittenhouse and it was crazy! They are psyched! And I am psyched for this dip! Hi Abbe, psyched is definitely a word you could use. :D And Zoe lives in a really fun area of Philly! Thanks for the comment. One of the most delicious appetizers for the games. Love the combo black bean and jalapeno. Hi Denise, isn't this a nice combo? Really good. :-) Thanks for the comment. yum - I could dig into this dip! Love all that flavor. Hope you enjoy the game - I'm sure it will be fun! OK, I'm sold! I'll be making this over the weekend for the games! Still have some cotija cheese. Just a little bit goes a long way, doesn't it? Thanks John! I’m so excited for the Super Bowl because A) I love football and B) this dip sounds so delicious. (I probably won’t even be able to wait until game day to make it.) Have a great rest of your week! Hi Tricia, this is just loaded with flavor! :-) Thanks for the comment. Hi MJ, Cotija cheese really has a TON of flavor! Love it, and it works so well as an accent flavor with this dip. Thanks for the comment. Hi Kelsie, you can make a batch this weekend -- practice, you know :-) -- then another batch the following weekend for the game! Thanks for the comment. Hi GiGi, this dip, of course. :-) Thanks for the comment. I love jalapenos and black beans and this sounds absolutely delicious! This is right up my alley! Aren’t canned beans the best?!! I still cook a lot of them from scratch, but canned are so handy! I think I would take your dip then use Rocquie's suggestion about serving it hot with melted cheese on top. Either way it would be popular. Hi Miriam, it IS delish! And you an easily make this a bit less spicy -- just reduce the amount of some of hotter ingredients. Thanks for the comment. Hi Agness, the red onion is really nice in this! Not too strong. :-) Thanks for the comment. Hi Caroline, the jalapenos and black beans are really a nice combo. :-) Thanks for the comment. Hi Mimi, we like beans cooked from scratch the most, but canned beans are awfully good quality. And canned are easier for this recipe. Thanks for the comment. Hi Karen, we should probably make a hot and cold version and do a taste test. :-) Thanks for the comment. Game day or not, this is a super easy and tasty recipe for any gathering or even for my little family for a meatless dinner. Thanks for sharing. Hi Amira, you can easily make a meal out of this. We did! :-) Thanks for the comment. Yeah, who needs dinner with a marvelous dip like this around!!! Definitely healthier than the usual game day fare---love that! Hi Greg, ready or not, the SB is here again. Good excuse to eat dip. :-) Thanks for the comment. Hi Liz, this actually is reasonably healthy. And does make a good dinner. :D Thanks for the comment. You nailed it, John, this is great for the upcoming Super Bowl party we need a simple appetizer for -- oh, so, YUM! Hi Judy, this is definitely simple and absolutely YUM! :-) Thanks for the comment. I'm not much of a football fan, but I do enjoy the half time show and all the good food! This recipe is perfect for both the Super Bowl and my new Instant Pot, winning here! Hi Deb, in truth, we often don't really watch the game either. :-) But we will have this dip! Thanks for the comment. Hi Carolyn, probably a wise choice! :D Thanks for the comment. Hi Pat, best thing -- after the flavor, of course! -- is how easy this is to make. :-) Thanks for the comment. Hi Dahn, food rules at Super Bowl parties! :-) Thanks for the comment. Hi Bobbi, definitely good grub! :-) Thanks for the comment. Hi Taruna, easy to do. :-) Thanks for the comment. A bowl of this, a cold beer and a good game would make anyone happy. Hi Amalia, yup! :D Thanks for the comment. This looks delicious and super flavorful! I could eat it all up myself! Hi Amy, it's really good stuff. :-) Thanks for the comment. This is such a great recipe, John! I've got it bookmarked and I already know this one is gonna be a new favorite around here. Love the flavors! Hi Marcelle, the flavors in this are wonderful! :-) Thanks for the comment. Hi Raymund, it does look a bit like minced meat! :-) Thanks for the comment. Hi Sherry, not the most attractive dish, is it? But REALLY GOOD! :-) Thanks for the comment. Hi Priya, nice thing about this recipe is you can spice it up to your heart's content. :-) Thanks for the comment. Love munching on chips and dips and this dip looks fab! Hi Emma, chips and dip is the best! And this is the best of the best. :-) Thanks for the comment. Hi Shashi, LOL re Brady Bowl! And it's always about the food with us. :-) Thanks for the comment. That bowl of dip is perfect not only for games but for any party! Love the ingredients that goes into this dip. Hi Shibi, it's basically a party in a bowl. :-) Thanks for the comment. Yum! I have most of the ingredients for this dip on hand - including the cojita. I'm eager to give it a spin. Hi Jeff, spin away! :-) Thanks for the comment.